Quarterback Jared Lebowitz throws for 320 yards and five touchdowns in 35-14 win over Mules. WATERVILLE — It took the Middlebury College offense almost a quarter to get rolling on Saturday afternoon, but once it did, it was almost impossible to stop. Led by junior quarterback Jared Lebowitz, a transfer from UNLV, the Panthers piled up 429 yards of offense at Seaverns Field, taking a 35-14 win over Colby College in New England Small College Athletic Conference play. 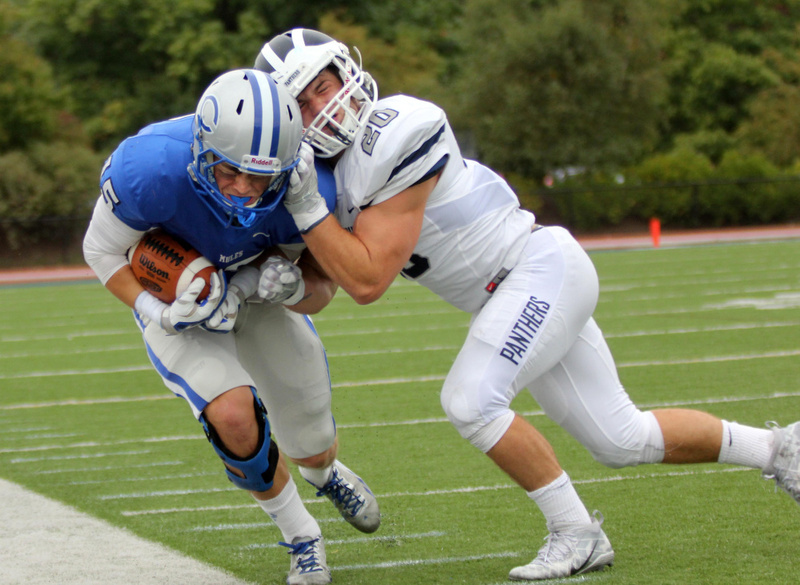 Middlebury improved to 2-0, while Colby is 1-1. Lebowitz completed 17 of 25 passes for 320 yards, and threw five touchdown passes for the second straight game. Four of the Panthers touchdown passes came on plays of 20 yards or greater. “He’s playing great. He’s just seeing the field really well, and our offensive line is giving him great protection. He makes us go. He’s the real deal,” Ritter said of his quarterback, who now has 689 yards passing and 10 touchdowns this season. “They protect the quarterback well and he can sling it. You’ve got to prevent those big plays,” Colby coach Jonathan Michaeles said. After its first two drives went nowhere, Middlebury started to find offensive flow on its third possession. Starting at their own 16, the Panthers went 84 yards in six plays, the big play coming when Lebowitz connected with Conrado Banky for 63 yards to the Colby 16. The drive culminated when Lebowitz hit Ryan Rizzo with an 8-yard touchdown pass, giving Middlebury a 7-0 lead with 13:34 to play in the second quarter. After a Colby three and out, Middlebury struck quickly, with Banky getting behind the Mules defense for a 64-yard touchdown pass from Lebowitz. After another Colby punt, the Panthers needed just two plays to score again. This time, James Burke caught a 47 yard touchdown pass from Lebowitz, and the Panthers led 21-0. Lebowitz added a pair of touchdown passes in the third quarter, 20 yards to Frank Coslito and 36 yards to Banky. The second came after Lebowitz left the game for a handful of plays after a hard hit. While Lebowitz proved stability under center for Middlebury, an injury last week to starter Gabe Harrington left the Mules with a question mark at quarterback. Freshman Jack O’Brien started, and was replaced by junior Christian Sparacio in the second quarter. The duo combined to complete 14 of 27 passes for 130 yards. 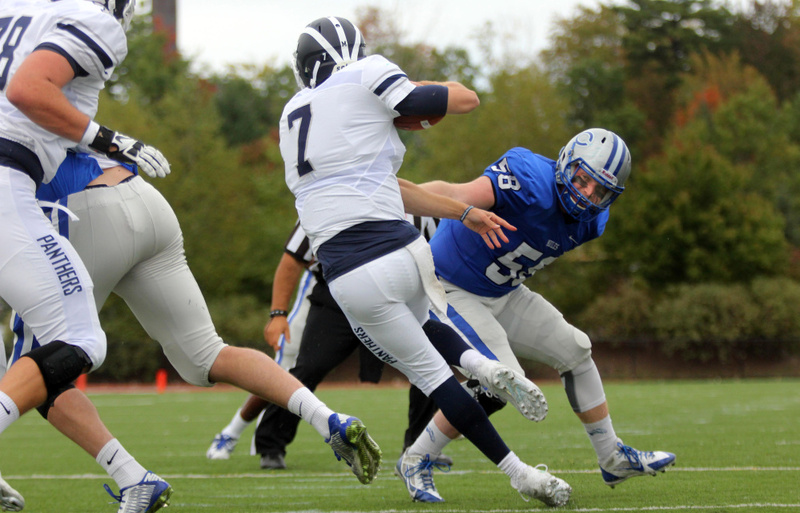 Colby had chances in Middlebury territory early in the first quarter, and came away empty. The Mules first drive was extended by a roughing the punter penalty, but fizzled at the Panthers 33. After forcing Middlebury to punt from the shadow of its own end zone, Colby’s second series began at the Panthers 36, before ending at the Middlebury 38. “We had great field position, and we just couldn’t capitalize. They played man coverage, they blitzed us, and we struggled on second down. We did a good job on first down. On second down they were teeing off on us. We had too many negative plays and struggled to protect our quarterback,” Michaeles said. Stopping Colby’s run game, particularly tailback Jabari Hurdle-Price, was key, Ritter said. The Mules gained 115 yards on the ground, with Hurdle-Price held to 43 yards on 15 carries. Colby scored a pair of late touchdowns. Sparacio ran in from 2 yards out to get the Mules on the board early in the fourth quarter. With 2:28 to play, Sebastian Ferrell caught a 29-yard Sparacio pass for a touchdown. Banky led the Panthers with seven catches for 198 yards. 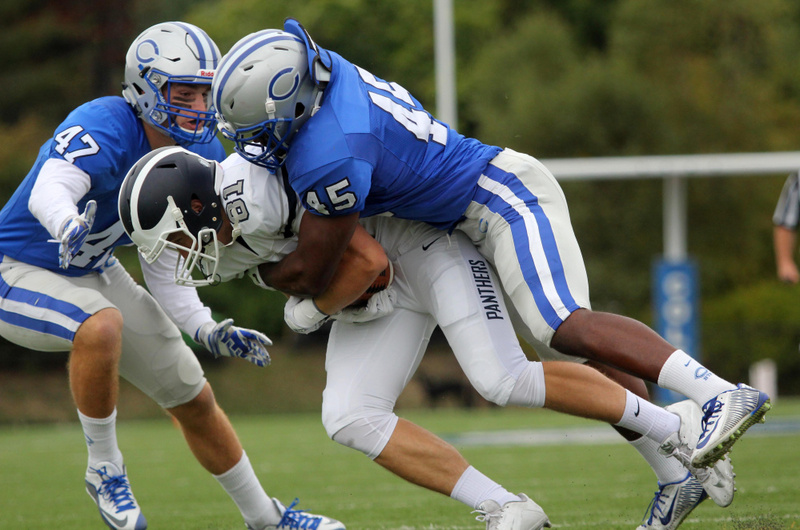 Sam Friedman had nine tackles, including a sack, to lead Colby’s defense. Ian Dickey had an interception for the Mules.